← “Oh Jeremy Corbyn” – Will You Chose The Old or The Young ? What Could You Do With £36 billion ? 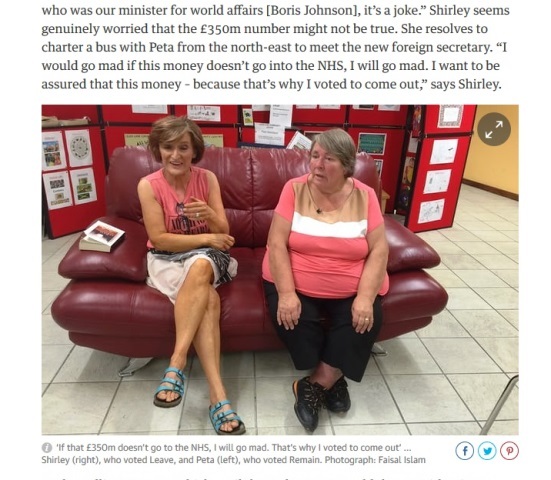 The Vote Leave campaign converted questionable economic statistics into powerful but ultimately false promises about funding the UK NHS in the 2016 EU Referendum campaign. Now, as Britain faces a £36bn bill for the first item on the Brexit menu, Brexiteers may face a hospital-cost blowback. Campaigners and politicians know that if you want to add some emotional oomph to a statistic to support your case, then convert it into something tangible which people care about. In the UK that’s certainly health, and the state of National Health Service is consistently number one public concern. In the EU Referendum campaign the Leave campaign made effective use of a claim that Brexit would liberate huge sums (£350m a week) to spend on the NHS. That same statistical translation could now come back to bite them, as Brexiteers grapple with how to communicate the fact that Britain may have to pay £36bn to the EU to meet its liabilities, just in order to get the Brexit negotiations properly underway. Brexiteers obviously see this as a political liability because they immediately started denouncing it as an outrage. 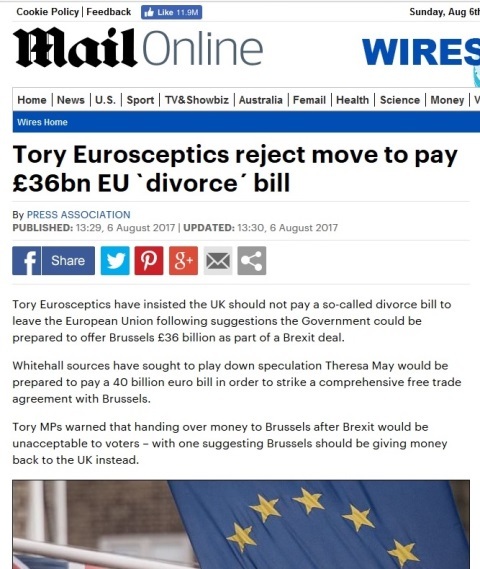 ‘Tory Eurosceptics reject move to pay £36bn EU `divorce´ bill’ ran a Mail Online headline on 6 August. Arch Brexit campaigner, Conservative MP Peter Bone even claimed that the EU should be paying the UK, not the other way around. Politicians and commentators appear to have settled on a new unit of measuring public spending – the hospital. So how much does a hospital actually cost? The £350m a week turned out to be a bit of ‘Fake News’ and was abandoned by the Leave campaign after the Referendum but it has stuck in the public mind, so it might be a useful way of breaking down that new number, £36bn. What About £36bn of Hospitals For The NHS ? As Dunbar points out, the actual cost of a NHS hospital is hard to nail down, as they range from much less to much more than £350m. 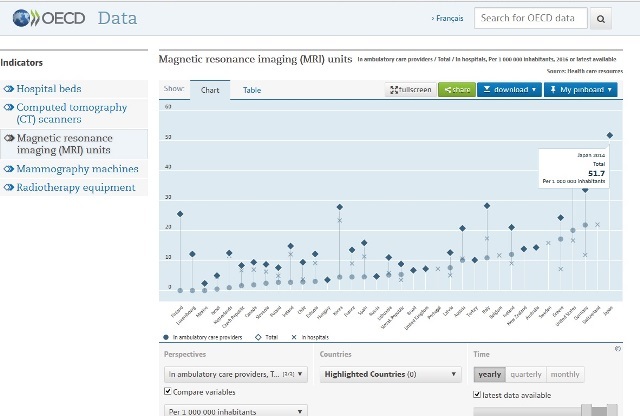 One thing that the NHS does buy, and for which the BBC found the figures were in general agreement is MRI (Magnetic Resonance Imaging) ‘Scanners’. It turns out that these useful diagnostic tools cost the NHS about £895,000 each. The cash-strapped NHS could certainly do with a lot more MRI scanners. 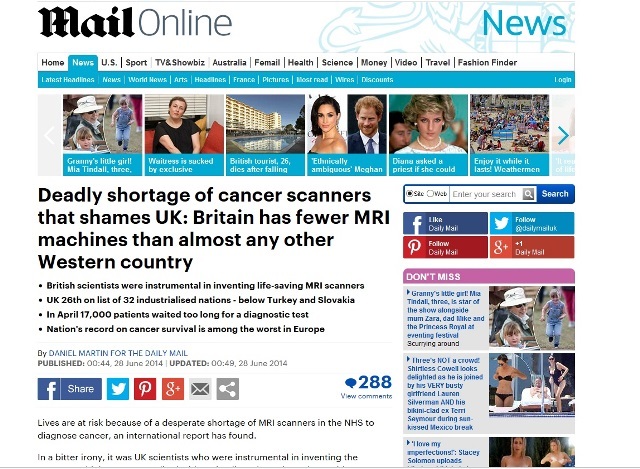 In 2014 the Mail Online, partner website to the right-wing Daily Mail, was outraged to discover from an OECD study that even Turkey and Slovakia have more MRI scanners per head than the UK. Headlining its report: ‘Deadly shortage of cancer scanners shames the UK’. The Mail added: ‘Nations record on cancer survival is among the worst in Europe’. What made this state of affairs even more galling, as the Mail noted glumly, is that the scanner was a British invention (or our scientists were at least ‘instrumental’ in inventing it). So for £36bn we could get a lot of MRI scanners. 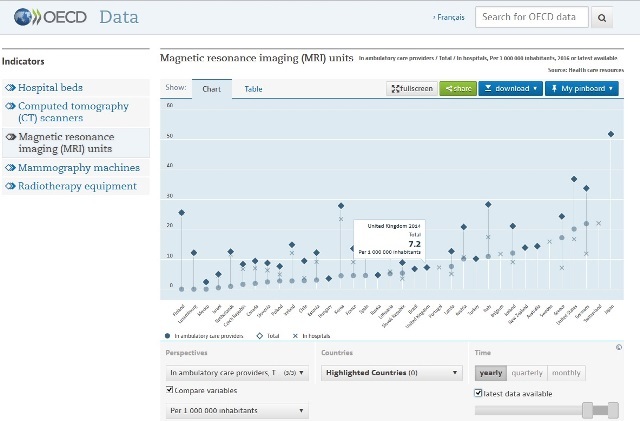 By my calculation the NHS could in fact buy 40,223 MRI scanners. Seeing as in 2014 we had only 467 of them, the UK could increase its scanner quotient 861-fold ! With a current UK population of about 65.1m, we’d have at least 40,690 MRI scanners, or one scanner per 1600 people. That translates into 625 scanners per one million people, putting Britain where it rightly belongs, at the top of the global scanner table, beating Japan 12 times over. 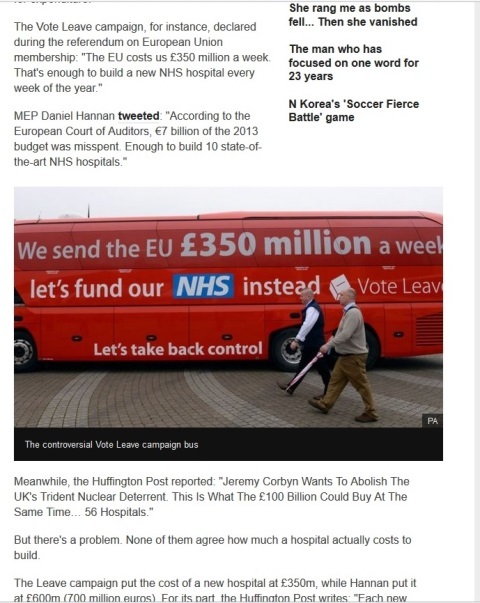 On Vote Leave’s figure of £350m per hospital, we’d get 102 new UK NHS hospitals for £36bn. Or rather the NHS isn’t going to get 102 new hospitals, instead the rest of the EU is going to get enough UK taxpayers money to build 102 new NHS hospitals. Good news that newspapers like the Daily Mail could celebrate. Except that there’s a catch: to get at that £36bn for the NHS, we’d have to not leave the EU. The Daily Mail of course, is a fervently pro-Brexit newspaper. To put it in Vote Leave terms, maybe ‘on the side of a bus’, this first stage of Brexit is going to cost the UK over 100 (102 at £350m each) new NHS hospitals. Or if you favour the greater certainty of the BBC’s preferred NHS unit of measurement, it will rob the NHS of over 40,000 MRI scanners and leave us languishing near the bottom of the international cancer- scanner ranking among developed economies. Makes you think doesn’t it ? It’s easy for professional communicators and politicians to regard fast-and-loose use of statistics and framing in a cynical ‘worldly-wise’ manner, as simply ‘par for the course’. 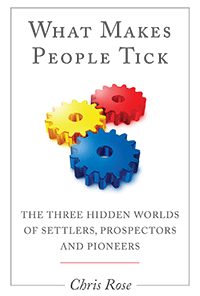 But the tragic thing is that it has had profound real world consequences, and some people were cruelly deceived by the promises of the Leave campaign.